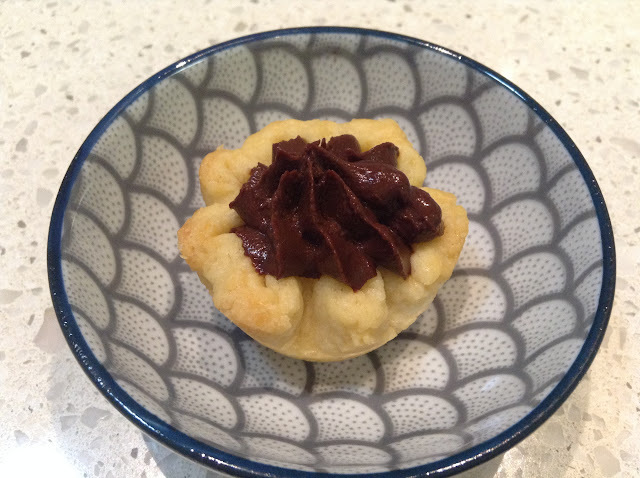 The Alpha Baker's task this week was to try out the Chocolate Ganache Tartlets from the Baking Bible. Turns out they're delicious, tiny little chocolate gems. They're not really for breakfast unless you're trying to get them finished to take to work and you absolutely need to carry out quality control. The pastry for the tartlets was a straightforward sweet pastry, except (of course) the beurre noisette it called for. I had no time or energy to make beurre noisette this week but I did have a tiny amount left over which gave the rest of the ordinary butter I used a little extra flavour. I didn't have any mini brioche tins either so I used my mini cakes tin. That left me in a quandary about how to shape the pastry cases. In the end I tried two different ways - one by rolling and cutting out a circle (the curly ones) and the other by pressing a ball into the tin (the straight ones). The cut out cases are prettier but the press-in method was easier. 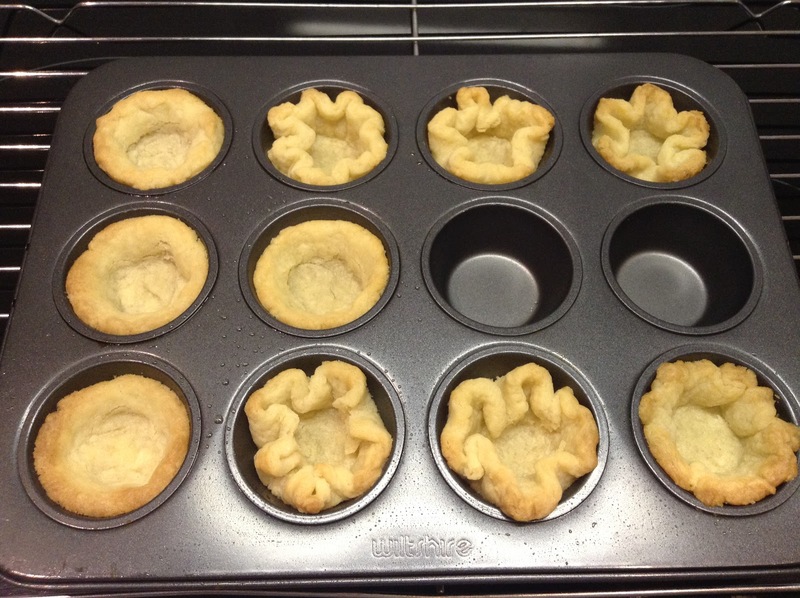 For those of us in the tropics, handling pastry is an invitation to soggy pastry after about one minute, and it was impossible to make little crinkles in the sides, as suggested in the recipe. When I was making the ganache filling (which involved the microwave and did not involve any sieving, both contrary to instructions), I happened to spy a bottle of Frangelico in the pantry. So I added a dash and when I wasn't sure I could taste it, I added a couple more. Armed with a new piping kit and a misplaced sense of confidence, I attempted the simple rosette of ganache in the pastry cases. Unfortunately the ganache in the bottom of the piping bag was initially too cold and left the rosettes with a flat top. I did manage to pipe out one nice-looking rosette before the ganache warmed up under the pressure of my hands on the piping bag, turned to liquid and started spurting out of the tip in a most unattractive way. These little beauties were all packed up to take to work but I forgot to take them out of the fridge when I left. What a shame. There was nothing to do but eat them myself. Next week we're making Lemon Icebox Cake which should do nicely as my contribution to the Biggest Morning Tea morning tea at work this week. 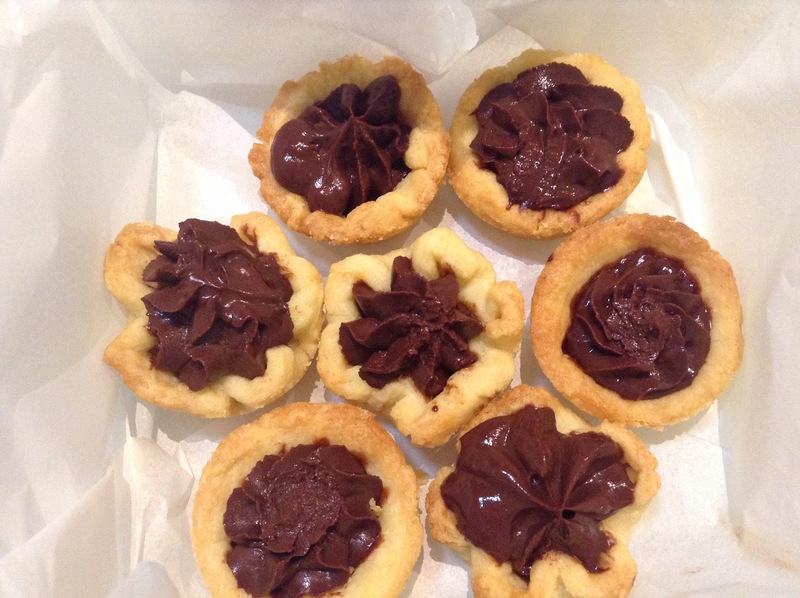 Starting the day with these chocolate ganache tartlets is my idea of heaven! Glad to see I'm not the only one playing hooky whilst Marie is away. The dough has been in the frig for two days so I better get cracking. You've inspired me!